Historical scholarship has more recently turned towards global histories of labour paying greater attention both to non-Western historical semantics of work, and intellectual as well as practical transfers between European, Asian, African, or American regimes of labour. 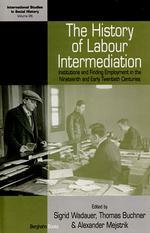 Labour intermediation – the various forms of seeking, or being forced to, work ranging from outright trafficking to consensual job placement – has been explored from a global perspective, too, thereby partly refuting the often-made claim that semi-institutionalized forms of labour intermediation (involving subcontractors or traffickers rather than the institutions of the contract and office) were characteristic predominantly of pre-industrial societies. Such global comparisons can look back at a rich field of historical research which since the 1980s has explored, somewhat diametrically opposed, the actual institution- and category-building around questions of work and (un-)employment in the emerging welfare states of France, Britain, Germany and the US. The present volume is informed by all these research agendas while also making its own distinct contribution to scholarship. Most of the 13 chapters combine the now classical perspectives both on the emergence of public labour offices and the ‘invention’ of unemployment as a social category with research into the, arguably, more discrete “intermediaries” (S. 16). Trade unions, welfare and craft associations, municipalities, commercial placement services, or indeed individual recruiters, persisted, at varying degrees, until the Second World War at least in fulfilling vital tasks of labour recruitment and social control, while continuously challenging the efforts by organizations of capital and labour to monopolize existing placement services. Chapters by Amit Mishra on the middle-men in the recruitment of Indian labour for the British colonial plantations in Southeast Asia, as well as by Anthony O’Donnell on the “regulatory rationales” (S. 392) behind public employment services in Australia around 1900 represent the turn towards global comparison, albeit modestly so. A section on the Habsburg Empire and the first Austrian Republic accounts for the volume’s main, and laudable, methodical contribution which lies in an amalgamation of the more common analysis of administrative files and statistics with multiple correspondence and text analyses in interpreting autobiographical accounts on the individual uses of labour offices. The four chapters here also redirect the ‘invention’ scholarship’s main focus from the insurance-based normalization of unemployment to the continued persistence of earlier forms of labour intermediation, most tangibly so in Sigrid Wadauer’s chapter on tramping in the search for work in rural Cisleithania. Overall, however, contributions do not uniformly subscribe to this multi-level approach. The wide range of methods presented causes some intellectual tensions which, while stimulating at times, come at the expense of a more compact presentation of the volume as a whole. Nevertheless, individual chapters have a lot to offer. That the varied acceptability of public labour offices was predicated upon a given labour market’s occupational and gender structure is shown respectively by Irina Vrana and Jessica Richter with regards to interwar Austria. Vrana argues that individual strategies to improve social status and income co-defined how offices were used, and also, conversely, how the period out-of-work was experienced individually. Richter underpins this observation by zooming in on domestic servants, whose individual career progression was shaped by competing struggles for professionalization and the different notions of vocation put forward by catholic and trade union-run associations. A number of chapters explore intermediation as a dynamic between job-related mobility and regimes of social control. In Cisleithania, as Wadauer shows, the rationale for granting admission to relief stations, unlike that of unemployment insurance, was deliberately based on perpetual mobility. Whereas the insurance principle intended to pin down in territorial space the individual by demanding a verifiable place of residence, relief stations forced wayfarers to actively follow job opportunities elsewhere due to time restrictions on their stay. Individual mobility was also crucial for brickmakers in 18th-century Lippe County albeit under a different system, as Piet Lourens and Jan Lucassen show: a specific form of sub-contracting involving various types of messengers and foremen and not least the cooperative selection among brickmakers themselves, induced by piece-rate wages for the entire work gang. The remaining chapters each adopt the more familiar perspective on the contested organization of labour markets. In colonial Australia – among the pioneers in public labour intermediation – government labour offices co-existed with commercial services until the 1930s, whereby the former even tended to “disorganize” (S. 394) the labour market by distributing available work according to need rather than suitability of workers. By contrast, Nils Edling provides good arguments to rate the establishment of public labour exchanges in Sweden as a success story. Other chapters highlight struggle and delays, partly exacerbated by disruptions to social and bureaucratic reform caused by inflation and the soar of unemployment in the wake of the 1929 world economic and financial crisis. The Reichsanstalt’s attempt in Weimar Germany at monopolizing vocational counselling, and the different modes of labour market organization involved as discussed, respectively, by David Meskill and Thomas Buchner are cases in point. Still, Buchner emphasises the offices’ overall effectiveness in shaping labour markets. Focusing on the Munich labour office, the systematic collection of statistics based on new office technology, along with the professionalization of placement officers, are shown to have contributed to the gradual replacement of the bourse model by a more abstract conception of the labour market, further objectifiable by gender, age, and occupational groups of the unemployed. In Britain, as Noel Whiteside argues, the aversion among government officials to such Prussian-style bureaucratism partly accounted for the state’s quasi-absence from processes of labour market organization. As a consequence, local labour exchanges in Birmingham targeted marginalized client groups rather than the whole labour market, and followed a “poor law ethos” (S. 85), which favoured an individualized appraisal of the applicant’s ‘good character’ over professional skills or qualification. The catalyst role played by World War One for the bureaucratization of local employment exchanges is not explored, but in arguing that Austrian employment offices for disabled war veterans proved an important precursor to the Reich-wide establishment of common labour offices, Verena Pawlowsky and Harald Wendelin highlight an interesting aspect of it. The editors should be applauded for going some way towards re-orienting historical research from the well-established focus on nascent systems of public labour intermediation to show the continuous persistence of older forms of labour recruitment and social classification as well as the precarious economic and bureaucratic conditions upon which public offices operated. Highlighting the multiplicity of ways by which people went about using (or evading) intermediaries and how that shaped, and was shaped by, policy regulations, war, economic crises, and not least competing notions of what counted as gainful work beyond the narrow conception of (male) wage labour surely is a significant contribution revealing a fascinating emotional landscape of hope, deceit, and human resilience. Having said that, the relevant chapters tend to present life stories, individual choices and administrative practice in a rather unrelated manner. To be sure, the individual biographies are fascinating in their own right, but actual encounters in the various offices would have constituted a further and, arguably, more significant field of inquiry because it is here that professional identities were performed and placements negotiated. The image reproduced on the cover of the volume, which shows such interactions between labour office personnel and presumably unemployed young men in Steyr/Austria in 1932 may be a good starting point for future research in this direction. In incorporating recent sociological work on the performative construction of markets Buchner’s chapter stands out. Others, such as Meskill’s would have benefitted from further contextualization in some grander or comparative historical narrative. For instance, the (attempted) installation of applied psychology within Weimar labour offices could be considered an instance of the ‘scientization of the social’ (Lutz Raphael). Lastly, I cannot refrain from pointing out that the rise of (austro-)fascism and war-related mobilization of manpower, with the notable exception of O’Donnell’s remarks on the shifts in Australian wartime direction of labour (S. 398f. ), are conspicuous by their absence. While the omission is understandable on research pragmatic grounds, the question arises to what extent the narratives of this volume, overwhelmingly presented from a nineteenth-century perspective, would need to be reframed if institutional racism, economic dirigisme, and manpower mobilization, which all gained momentum from the 1930s, were incorporated. But these transformations are for future research to explore. E.g. Jörn Leonhard / Willibald Steinmetz (eds. ), Semantiken von Arbeit. Diachrone und vergleichende Perspektiven, Köln 2016. Ulbe Bosma / E. van Nederveen / A. Sarkar (eds. ), Mediating Labour. An Introduction, in: International Review of Social History. Special Issue 20 (2012), S. 1–15. E.g. Robert Salais / Nicolas Baverez / Bénédicte Reynaud, L'invention du Chômage. Histoire et Transformation d'une Catégorie en France des Années 1890 aux Années 1980, Paris 1986; Christian Topalov, Naissance du chômeur 1880–1910, Paris 1994; Bénédicte Zimmermann, Arbeitslosigkeit in Deutschland. Zur Entstehung einer sozialen Kategorie, Frankfurt am Main 2006. The focus on Austria derives from the Vienna-base of the project entitled “The Production of Work. Welfare, Labour-Market and Disputed Boundaries of Labour 1880-1938” from which this volume emerges. Raphael’s concept has recently been further developed. See Kerstin Brückweh et al. (eds. ), Engineering Society. The Role of the Human and Social Sciences in Modern Societies, 1880–1980, London 2012. Jochen F. Mayer: Rezension zu: Wadauer, Sigrid; Buchner, Thomas; Mejstrik, Alexander (Hrsg. ): The History of Labour Intermediation. Institutions and Finding Employment in the Nineteenth and Early Twentieth Centuries. New York 2015 , in: H-Soz-Kult, 22.02.2018, <www.hsozkult.de/publicationreview/id/rezbuecher-24668>.